The Turn Blade Finishing Grader/Scraper/Planer have a unique and patented design that can fold up from 7m wide to 2.6m. The draw-bar folds back, and the right-hand tandem swing arm folds in behind the Grader to give you a total length of 6.8m. You can also swing the drawbar anticlockwise and you can pull the unit on farm roads and through farm gates. The cutting blade with mouldboard can tilt forward or backward to your specific requirements. This Scraper/Planer is also called a Pull Dozer. The cutting blade angle can adjust to 5° with two independent hydraulic cylinders on each side. The blade angle can also be set by swiveling the drawbar anticlockwise or clockwise for different cutting angles. 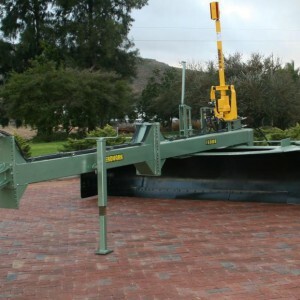 The Grader/Scraper/Planer has a GPS/Laser bracket fitted left and right on top of the blade. 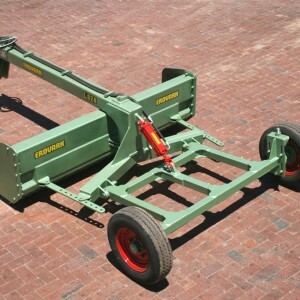 This Grader/Scraper is suitable for Agricultural and Industrial applications. 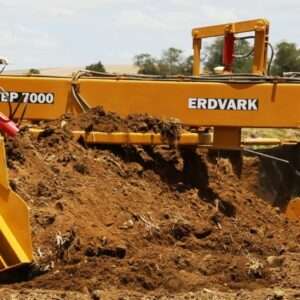 The Erdvark FG Finishing Grader is for Heavy Duty land planing, leveling and finishing of irrigation fields. This is a dual purpose Grader that can also do road maintenance and building. The Erdvark FG Finishing Grader is available in blade width of 3.1 m to 5 m and the tractor requirement is 65 kW to 140 kW. The Finishing Grader can be supplied with Tandem Wheels for more stability. The Finishing grader can also be supplied with a solenoid valve to make it Laser Ready and a further hydraulic switch between Laser and Road Grader.